A slice of small town mythology set in Atlantic Canada, The Shipping News contains plenty of heart but little spirit. Although likable enough, the story fundamentally lacks a purpose, resulting in characters wallowing in an aimless breeze of nostalgia. 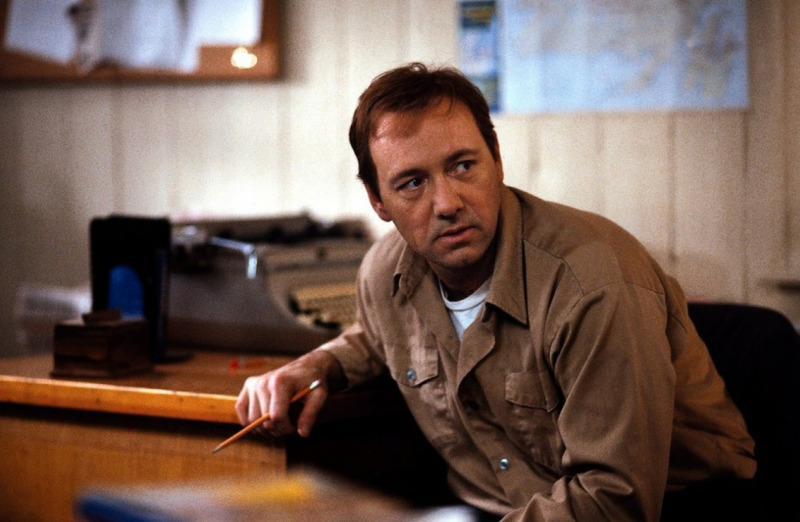 Quoyle (Kevin Spacey) is a simple, meek, and somewhat dim man, raised by his stern parents in upstate New York. The free spirited and comparatively wild Petal (Cate Blanchett) literally falls into Quoyle's car, and before he knows much about what is going on, they get a married and have a daughter Bunny. Not long after that, Petal abandons her husband and child to cavort with a succession of men anywhere but home, and then her departure is suddenly made more permanent. To make Quoyle's misery complete, his parents commit double suicide. Aunt Agnis (Judi Dench) convinces Quoyle to relocate with Bunny to the family's ancestral home on the jagged coast of Newfoundland. They find a dilapidated but still standing wreck of a house anchored to a windy cliff, and start their life over, with Quoyle securing a job as a reporter covering shipping news for the local newspaper. He gradually starts to learn his family's incredible history, while getting to know the local colourful characters. 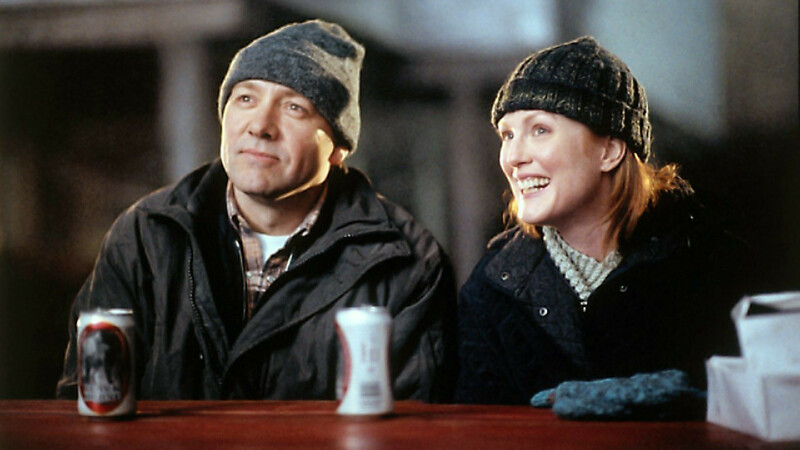 Quoyle also starts a tentative relationship with the widow Wavey Prowse (Julianne Moore), the elementary school teacher who harbours personal family secrets of her own. Once Quoyle, Bunny and Agnis relocate to Newfoundland, The Shipping News struggles to find a compelling navigational direction. In the hands of director Lasse Hallstrom, the adaptation of E. Annie Proulx's 1993 Pulitzer Prize winning novel fragments into a series of splintered encounters with the locals and with history, never less than interesting but failing to click into a cohesive whole. The overall taste is that of cold detachment, the film as passive a Quoyle's personality, waiting for things to happen and rarely setting an engaging agenda. Predictably, everyone in Newfoundland has a fascinating, tragic, or funny backstory, the locals are mostly grizzled but warm hearted, fishing is in everyone's blood, and the ties of history extend far into the mists of legends that still govern modern actions. Quoyle wanders around discovering stories of the past influencing the present, poking his nose to sniff out the secrets eagerly shared within the local culture. The rather tired message of letting go of the past and embracing the future is hammered home during a wind storm that proves to be too much even for the venerable family house. Kevin Spacey is an empty shell as Quoyle, a performance that requires the projection of quashed emptiness. Judi Dench is the stoic aunt, camouflaging deep scars of her own. Julianne Moore has little to do except encourage Quoyle to meet the future while she evades her past, and Scott Glenn hides behind a lot of bombast as Jack Buggit, the newspaper owner and local warrior, savvy enough to cheat death itself. Cate Blanchett is entertaining and exaggerated as the self-centred Petal, but she is not in the movie long enough to alter the pervasive energy level. The Shipping News promises smooth sailing, but loses an oar in choppy seas.